The German Shorthaired Pointer is an athletic hunting dog with agility, power and endurance, and has a superior scent ability. Exercise is important for this highly energetic dog breed. German shorthaired pointers become unhappy when they are isolated from their family. The German Shorthaired Pointer originated in Germany. German Shorthaired Pointers range from 21 inches to 25 inches. German Shorthaired Pointers range from 40 to 55 pounds. German Shorthaired Pointers are typically a combination of liver and white or solid liver. German Shorthaired Pointers' coats are short, dense and hard to touch. Relatively easy to maintain, the short and shedding coat requires only minimal brushing. The German Shorthaired Pointer is an energetic dog. If not given a sufficient amount of exercise, both mental and physical, this dog breed can become frustrated. The German Shorthaired Pointer is a family dog, but sometimes it can be overly rowdy with small children and aggressive with small pets. The German Shorthaired Pointer is considered to be an independent dog breed. 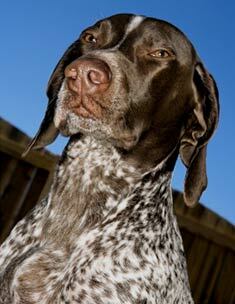 The German Shorthaired Pointer is susceptible to hip dysplasia, epilepsy, gastric torsion and entropion. The expected life span of the German Shorthaired Pointer is 12 to 14 years. 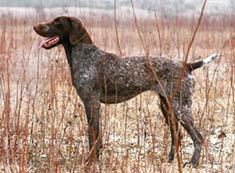 German Shorthaired Pointers are suited for country living. Hunting provides the best form of exercise for this dog breed. If living in the city, a house with a fenced yard is essential for this active dog breed. The German Shorthaired Pointer is in the Sporting group. Find German Shorthaired Pointer Puppies with our Free Breeder search!